Fifteen-year-old Jane loses her arm in a shark attack, but she’s lost more than that: her innocence, her privacy, and most crushing her artistic talent (dependant on her good - now gone - hand). To friends, acquaintances, and strangers alike, she is now known as Shark Girl, as a story rather than a person. SHARK GIRL is simultaneously an affecting tale about healing as well as a convincing portrayal of the intrusive nature of media. I loved this book and, to be honest, I wasn’t even sure I would like it. I’ve mentioned before that I have a lower standard for books I listen to on audio rather than read. I also have a lower standard for books I borrow from the library rather than buy. If I pay for it and have a physical copy that I’ll likely keep, I better like it. However, I’m much more willing to take chances on borrowed books. I took a chance on SHARK GIRL and am immensely grateful that I did. And it wasn’t love at first sentence either. Initially, I balked at the lyrical style of prose. This book is written in verse. Don’t worry; it doesn’t rhyme. However, it does utilize line breaks for adding rhythm to the words that puts one more in mind of poetry than a novel. However, I’m a big believer in the idea that first you need to understand the rules before you can break them. 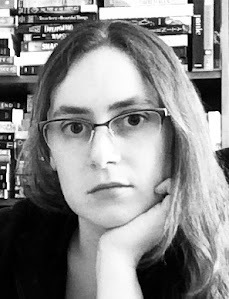 The reason I shy away from novels written in verse is that usually, well, it’s terribly done, something the author thought would be a unique idea but it’s only a poorly executed distraction from the story. I’m relieved to say that SHARK GIRL is one of the exceptions. Once the story hooked me enough, I moved past my prejudices and actually began to admire how deliberately the line breaks add beats between thoughts, pauses within a sentence. Of course, the writing style also makes this an extremely quick read. If you are remotely interested in this book, you have no excuse not to read it; it will take you hardly any time at all. I finished in three days, and those are days I worked eight hours, wrote, worked out, socialized, and read chunks of other books. 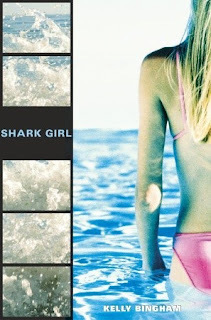 My point is that I think had I focused on SHARK GIRL alone, I could read it in maybe 2 hours. I also admire the author for how succinctly she crafts her characters. With minimal words, she creates a complex and believable cast, only telling us as much as we need to know and often revealing quite a lot with only a little. First there’s Jane and how can’t you sympathize with her? She resents all the media attention and the book includes an assortment of letters from strangers that demonstrate the wide range of compassionate to insensitive (not to mention unsolicited) feedback drowning this poor girl. In particular, Jane hates the idea of herself as some kind of showcase for survival. She isn’t ready to be grateful that she’s alive; she wants some time to be bitter. Most of all bitter about the loss of her spectacular artistic talent. Then there’s all of Jane’s family and friends. I challenge anyone not to fall for the little boy Justin who Jane meets in physical therapy. Then there’s Jane’s mother with her admirable support but also relentless pushing her ideas of how Jane should move on. (Like switching to digital art, which wouldn’t be as hard with her non-dominant hand, but Jane wants a pen and paper.) Jane’s brother, like many siblings, is at once her hero and arch-nemesis. He saved her life and does his part to shelter or challenge her as needed, but sometimes the challenge part isn’t welcome and his blunt honesty can be merciless. Even Jane’s friends mostly understand, but she still encounters some callous comments and efforts to mold Jane into the post-trauma heroine they want in their lives. Like all good books, the core of this story is universal. It’s about being yourself. When the whole world is crushing down in an effort to shape you to other people’s image for you, the most heroic thing you can do is shape yourself.